I was pointed to this section of the forum, hopefully someone here might shine some light on my questions. So i've got this Yoshimura Yr2-31 Cam aka "Daytona" for a cb500 k1. One thing i noticed while timing the cam is that the inlet valve is begining to open at 49-50 btdc, Thats where the cam card says ill want ignition. My question is. 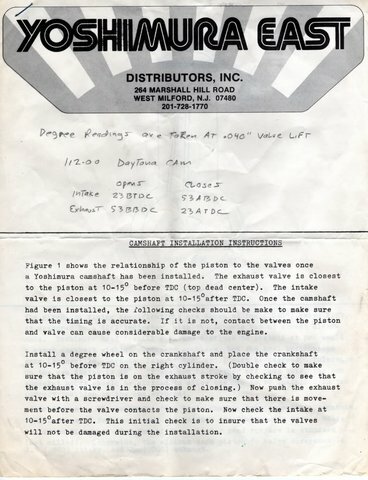 if the valve is closing at 49 and the ignition occurs at 50 does this do any damage to the engine or just a powerloss? The only information i found about this cam is from the 750 version of the cam, Some information such as clearances i assume to be the same. the 750 only wants 3degrees more advance. I dont know the stock cb500 advance but i think its around 30tdc thats why 50 sounds like adding around alot with 20 degrees. I dont know much about the 750 since ive never owned or read about how they perform. Engine is fitted with Yoshimura 550 high comp pistons marked pop, got some porting aswell (atleast the rouch casting surfaces have been removed my novice eyes can see). using the recommended valve springs. rest is stock more or less. Follow Mike's advice on lobe centers. Disregard the ignition lead, that's nuts. A couple of us were running as low as 28 degrees. A 500 chamber is quite small & effective with tight squish so no need for such ignition advance. Not exactly sure what this means. At all. This is my first time working on an engine. I need to read up, tried google but not really sure what im looking for. 28 degrees, aint that less than stock even? Would this mean that a bike with 50 degrees ignition would run like a pos? The 3 degrees on the 750 seems more in to line to what your suggesting here. I knew something didnt add up here. On side note, is there a "unused" spark on these engines every other? I guess the correct answear to most questions is to get a dyna S and bench test it. But, i think its best to get the engine running okay before mixing in more advanced things that can make me scratch my head. Does anyone know of a Cam with similar characteristics as this one? Perhaps there is a cheaper "copy" with better documentation? not sure what you mean by 3 degrees on a 750, maybe static? the most significative parameter is full advance like brent said. if you have high comp pistons, you could easily back down to 30 something. really easy to rotate the plate one way or the other by the side of the road and see what the engine likes best. Yeah i guess that seems like a good way to start. Having too much wont damage the engine just it running real bad? About locking the ignition, is there any sense in that or is that just BS? and i would not lock the ignition. Intake Installed Centerline of 105.00 degrees ATDC. Exhaust Installed Centerline of 106.50 degrees BTDC. you need to use the opening/closing numbers that you measured. is that what you put in? I used the numbers on the camcard. Should I correct it with what I measured up? uh yes. you want to know how your actual cam is set up. i think it will be fine but this can give additional confirmation. and as mike says LCs should be at 105, you'd see if you match that. Intake Installed Centerline of 106.00 degrees ATDC. Added my numbers. My LC is at 106. Forgive my ignorance but do I use this to calculate the optimal ignition or are we still degreeing the cam? as to ignition lead: i'd take the advice of the guys here to ignore the camcard for that, and set it at a more usual value. Is this a race engine? Are the Yosh pistons 59mm or larger? They would have locked the mechanical advance for racing, and the thought was likely to start ignition earlier because of a large piston dome. Plus for shorter tracks, a little more advance would help some. 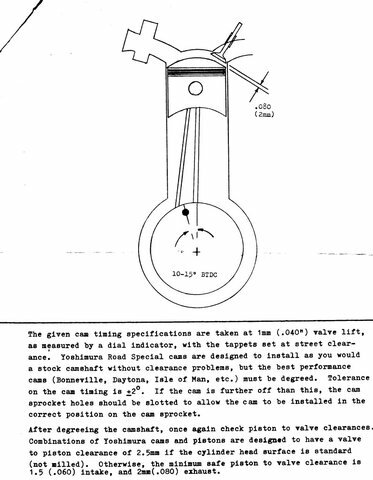 For another example though, when I bumped CR with a different piston design, I needed to alter ignition lead from 28 to 31 degrees. This was done on a dyno for best power. This is the reason I thought 50 degrees was wild! It is not a race engine, although im thinking of taking it to a track with the classic racing guys training. 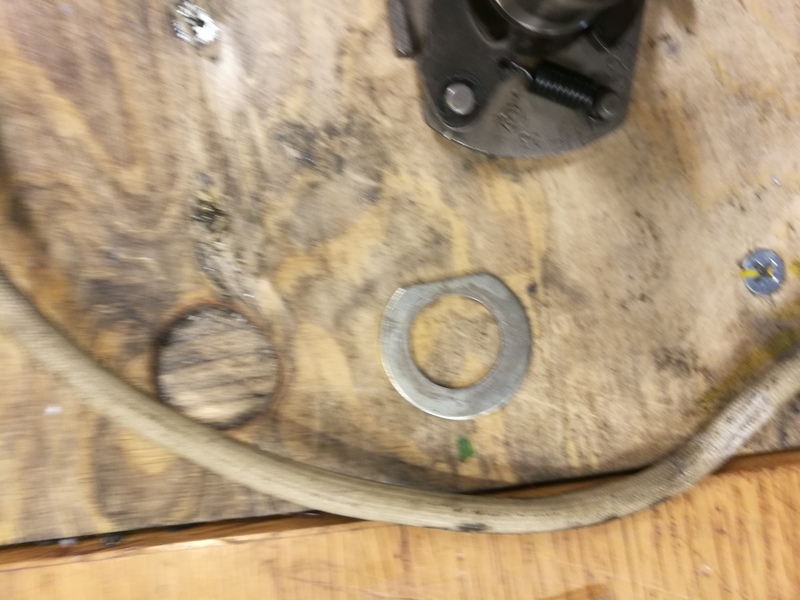 I didnt measure the Piston diameter, i only checked everything was within spec and used the new piston rings that was supplied with the motor. Pistons was marked with pops and 550 on the side. About the high compression, domes doesnt look overly extreme. Im running 2,5mm on intake and 3.5mm on exhaust valve to piston clearance at 0 valve-rocker clearance. the PO didnt mention anything about it being raced. If you look closely below you can see that 50 degree is marked on the grading wheel for some reason. im thinking the reason is the ignition. Alot of clues point towards 50 degree although i dont personally understand the physics behind it. Why would Yoshimura write out it on the cam card, i mean they are the experts (pretty much the polarity to me) Maybe there is a alot of information missing. I guess ignition timing is just not all about the cam. 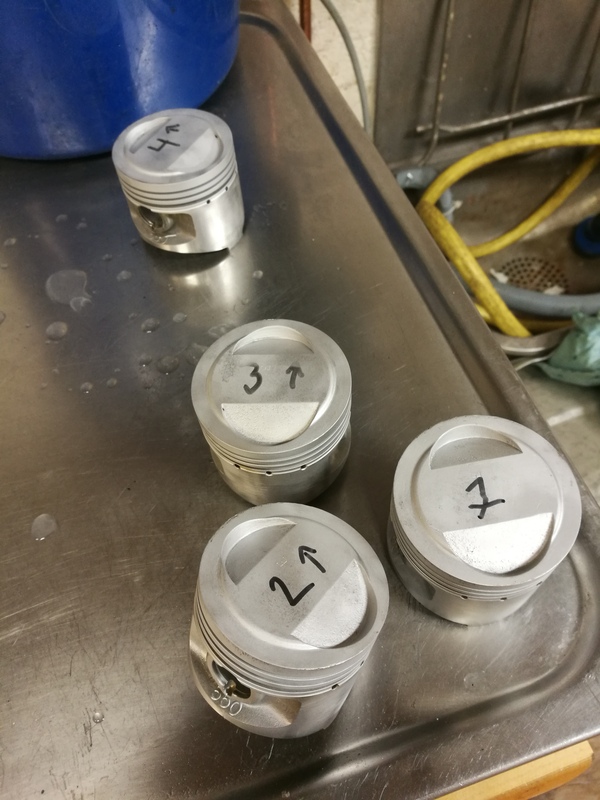 Piston size, fuel composition, valve sizes etc. EDIT: Now i remember, the PO wasnt the first owner of it. He bought the high perfomance parts from a friend of his, Maybe he raced the parts. 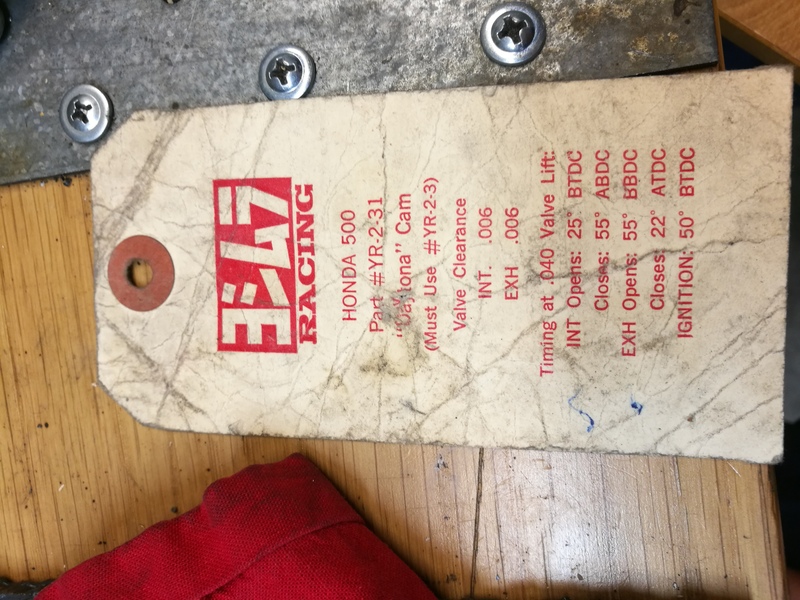 Whats the standard cb500 ignition timing? 28? Whoa! STOP... Take a look at how far down in the hole this piston is at 50 BTDC. This is a nitro burning engine, we fire the spark plugs at 50+ degrees BTDC, this one I set at 54. Gasoline doesn't want ANYTHING close to this much ignition timing... I'd bet on pump gas you'll hear the tell-tale rattle of pre-ignition on a warm day under load when you get close to 30 BTDC. 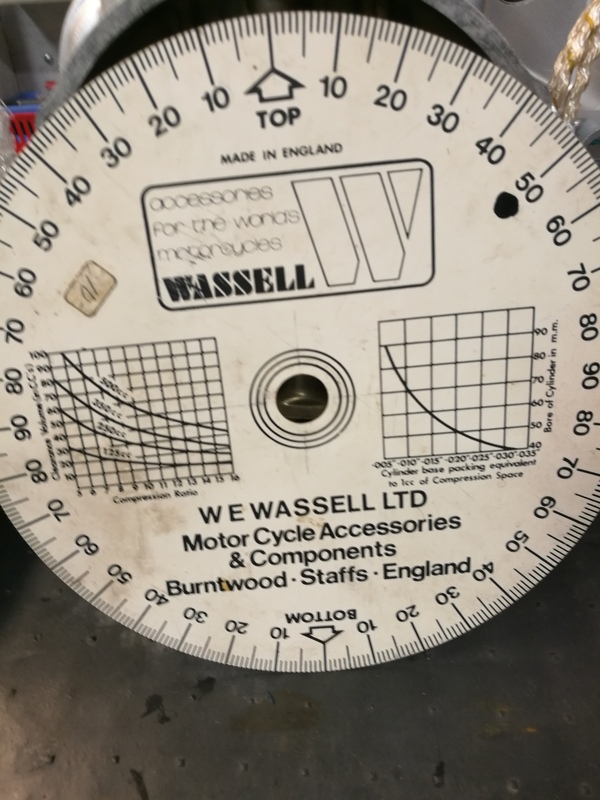 Start with stock timing and tune by the seat of the pants dyno / calibrated ear. And for goodness sake please listen to these fellas that really know of where they speak. Lobe Centers at 105 sound great. Whoa! STOP... Take a look at how far down in the hole this piston is. This is a nitro burning engine, we fire the spark plugs at 50+ degrees BTDC, this one I set at 54. Gasoline doesn't want ANYTHING close to this much ignition timing... I'd bet on pump gas you'll hear the tell-tale rattle of pre-ignition on a warm day under load when you get close to 30 BTDC. Start with stock timing and tune by the seat of the pants dyno / calibrated ear. And for goodness sake please listen to these fellas that really know of where they speak. Lobe Centers at 105 sound great. Yeah this is the type of information i was looking for. This confirms all of the above. i think we safely can discard all of the "advice" of the previous owner. and for the cam card, that might be as simple as a typo?